This is not a movie but a dirge. 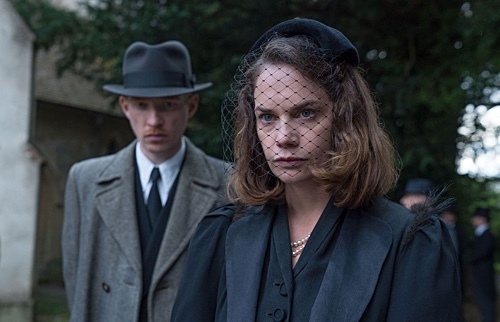 Based on the novel of the same name by Sarah Walters, “The Little Stranger” relies on mood and atmosphere to create a dramatic horror film, but substance is nowhere to be found. It is proof that simply parading around sad-looking faces, increasingly dilapidated eighteenth century estate, curious accidents and deaths, along with a melancholy score does not magically conjure up interest. What results is a film that works as an effective sleeping pill even for the worst insomniacs. I get what it is trying to do. The filmmakers wish to tell a story of a man so desperate to escape his class, one that he is deeply ashamed of, that his presence around the once marvelous and enviable Hundreds Estate triggers a possible supernatural phenomenon. Dr. Faraday’s deep yearning—ever since he was a boy—of wanting to belong in the estate, to own it, inspires the house itself to get rid of its current inhabitants (Charlotte Rampling, Ruth Wilson, Will Poulter) by driving them to madness. The story is a metaphor for self-fulfilling prophecies, of childhood dreams and traumas, of insatiable desire for upward mobility. There should have been heft to the material. It might have worked as a novel because written pages allow for internal monologues. However, translating the original material onto film is a monumental task for a tale like this. Because there is no narration designed to communicate a range of unexpressed thoughts and emotions, it must find or create a source of urgency in order to capture the attention and imagination of the viewer. Instead, we are given one soporific dialogue after another; notice that every other scene is meant to explain the overarching metaphor and so the material does not get a chance to truly take off. I got the impression that Lucinda Coxon’s screenplay does not fully trust the audience to understand the type of story being told and why. And so, due to its constant need to elucidate, boredom is created. The commoner with a medical degree is played by Domhnall Gleeson. In the middle of it, I began to feel sorry for his efforts. Clearly most comfortable in dramatic roles, notice how he milks the seconds whenever the camera rests on his face. Dr. Faraday need not say a word because we feel him—by carefully observing his face and body language—wrestling with the potentiality that he may in fact be responsible with the recent misfortunes of the Ayres household. He is a man of science but science fails to explain the increasingly bizarre events. In other words, Gleeson’s performance attempts to elevate the material, but the work is so thin that lifting a dead horse proves futile. Director Lenny Abrahamson is correct in not showing ghosts, poltergeists, or apparitions outright. Instead, he employs flashbacks and photographs to underline the fact that people have come and gone in the Hundreds estate. Their memories are the ghosts; maybe they can even see the living through their well-framed photographs. Despite its restraint from showing the literal, there is not enough urgency that propels the drama. For instance, the current residents lack the required character details so that when one of them gets taken out of the equation, we feel his or her absence. Ironically, this is comparable to extremely obvious slasher flicks in which we end up not caring about the characters dropping like flies.